Note: This review will contain a major spoiler for the rest of the series. Please don't read further if you haven't read all of the previous books! One fateful spring morning, Flavia de Luce, her father, and her two sisters journey to the train station. After years of uncertainty, their mother Harriet is finally coming home. As Flavia waits, she is approached by a stranger. He tells her that "the Gamekeeper is in jeopardy," which makes no sense to her. But moments later, that same man is pushed in front of the train and dies. What did his warning mean? Who is the killer? This time, Flavia's investigation will take her deep into her own family's past and she will learn closely held secrets about the people whom she loves most. This series is about to go through major changes and this novel was the perfect transition. As we read, we get the feeling that we are actually hurtling towards something. After five books of half-truths and secrets, the reader and Flavia are equally desperate to find answers. That is the true heart of this series. It's fun and quirky, but it is most intrinsically about a family with deep wounds and dark secrets. Mr. Bradley has made us truly care for Flavia, her family, and the residents of Bishop's Lacey. The possibility of closure and a happy ending is enough to keep us rapidly turning pages. While The Dead In their Vaulted Arches marks the end of this story arc, Mr. Bradley will be writing four more Flavia books. Flavia, as always, is so grownup and such a child. She is smart as a whip and excels at chemistry and deduction. But she is also a child who is often left to her own devices. 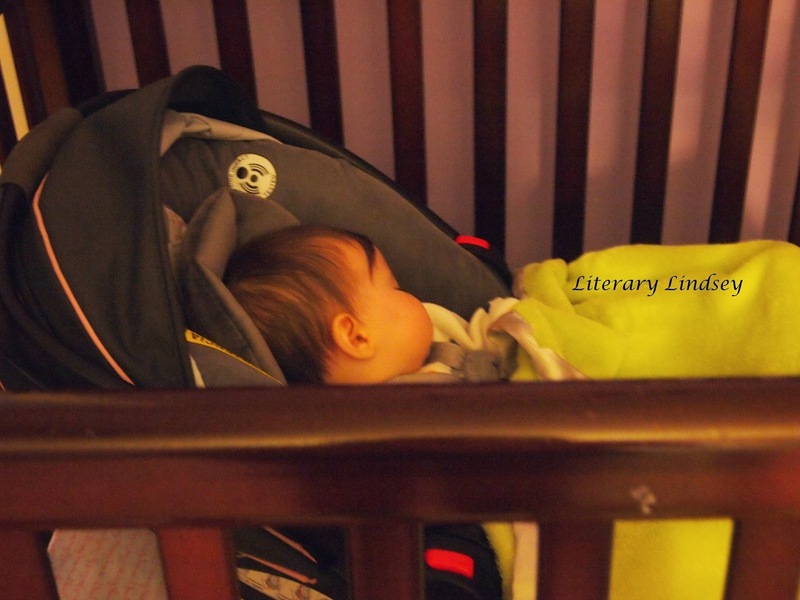 She is lonely and keenly feels the hole in her life where her mother should be. She spends a majority of this story trying to use her chemistry skills to make magic, in a heartbreaking example of childish optimism. But she is also on brink of her twelfth birthday, and about to make a hesitant transition from childhood to adulthood. It is a difficult feat for an author to transition his protagonist from childhood to adulthood and keep utilizing her as the main character. But I have the utmost faith that Alan Bradley can achieve it. 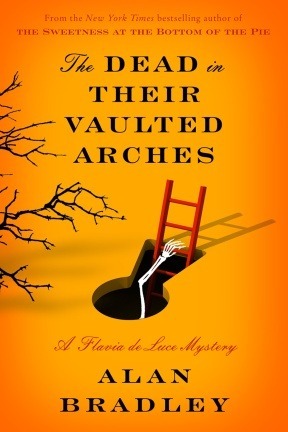 The Dead In Their Vaulted Arches is one of those books you don't want to talk about too much. The joy of this book is starting it on the edge of your seat, just as Mr. Bradley leaves us at the end of the previous book. Reading this story will remind you why you love Flavia all over again. Her wit, her bravery, and her resilience all shine bright as she attempts to solve her most personal mystery yet - what happened to her mother. If you are a fan of this series, this is an addition you won't want to miss. If you don't love these books yet, consider it a gift that you can pick up all six books and read them in one glorious literary binge. A picture of each of the kids once a week, every week in 2014. Becca Grace - Sometimes when you are sick, you sleep in your car seat...so breathing can happen. Baby girl is feeling awfully miserable. Prayers are appreciated! 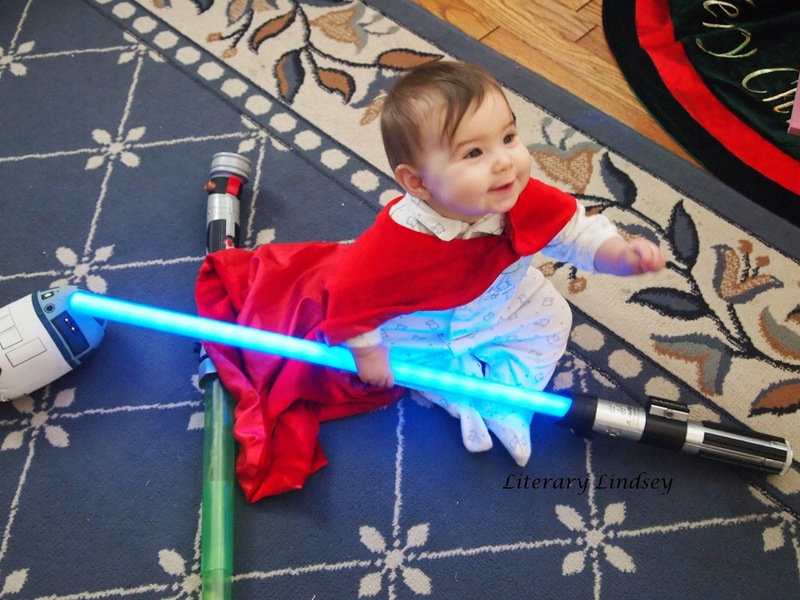 David - The boy is all set - a book, lightsabers, and pants that are already too small. By the way, that tooth he is wiggling did finally come out! 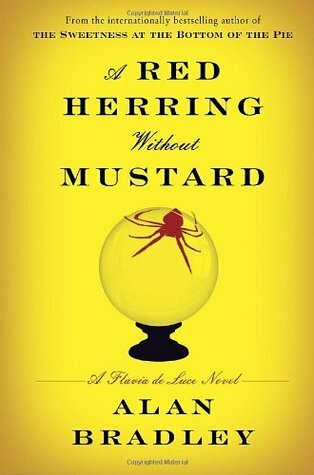 After I received the newest Flavia de Luce mystery from Netgalley, I realized that I was woefully behind. So I did what any good bibliophile would do - picked up the the three books I needed to catch up on from the library and binge read them in a week. Here are my thoughts on the three books. Each of the three books involves Flavia solving a mystery in her beloved village of Bishop's Lacey. In A Red Herring Without Mustard, Flavia discovers a newly befriended Gypsy woman nearly bludgeoned to death in her caravan. In I Am Half-Sick of Shadows, financial trouble forces the de Luce family to open their beloved Buckshaw to a film crew. When the leading lady is murdered, everyone is a suspect. 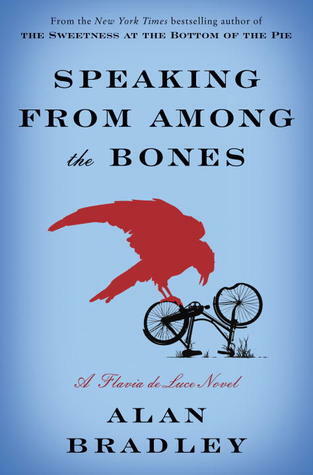 Then, in Speaking From Among the Bones, Flavia can't miss a good body so she makes sure to be on hand when the local church digs up St. Tancred, its patron saint. No one expected to find the body of the church organist as well! Of the three, Speaking From Among the Bones was my favorite. It had great pacing, an engaging mystery, and fascinating character development. Bradley also used this book to really utilize characterization and plot points from previous books. This is also where you begin to feel that you are reading towards something - that something is decidedly the latest book The Death In Their Vaulted Arches. So now I want to discuss what I like about this series as a whole with regards to these three. Flavia serves as our way into both the de Luce family and Bishop's Lacey. We meet all of the other characters through her 11 year old eyes. Much to Mr. Bradley's credit, the reader truly believes that this girl is capable of solving mysteries and expertly combining chemicals. But Flavia's (mis)adventures really serve a way for us to get to know the griefs and joys of the people she meets. We encounter many characters, including Flavia's father and Dogger, a member of the household staff, who are still reeling from the effects of World War II. Because Flavia is still a child, she goes mostly unnoticed and is privy to some very private moments of grief among her own family and among her neighbors and friends who have lost loved ones. These moments help Flavia to grow up but they also give us an intense and very well-crafted look into the ways that people deal with the horror of war and the pain of loss. 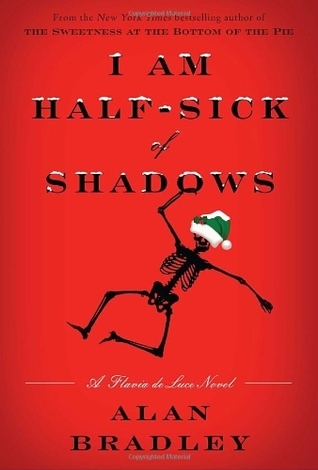 The Flavia de Luce stories are a perfect mix of several genres. While these books are categorized as mysteries, they are so much more than that. Readers get to experience the quaint village of Bishop's Lacey, where we meet quirky but painfully realistic characters. Mr. Bradley also shows us the visible and more insidious effects of a terrible war. At its very heart, we become a part of the de Luce family - the sibling squabbles, the family secrets, and the attempts of both adults and children to love each other in the best ways that they can.This is a series that no one should miss. It's Monday and everyone is sick! Hello friends. Here are some highlights from my week: doctor visits, infant tylenol, sitting in a bathroom full of steam with a baby, snow days, sick days, naps, and lots of tissues. Yup, we are all sick. So now we move onto the bookish part of this week, which I fortunately did several days ago. In the interests of all those legal and ethical things, I need to tell you that the author of this book is my sister. 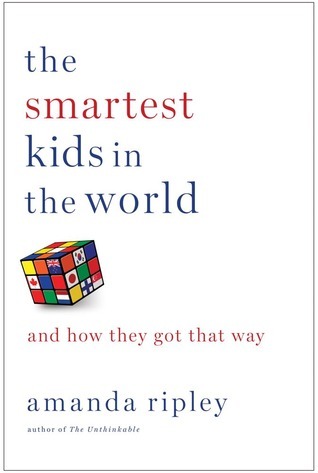 In the interest of wanting you to read really good work, I need to tell you to read this book. Hands To Hold For People Trying Not To Cry in Public Places is a collection of poetry about life, love, and that wretched part of life when you feel like an adult but are treated like a child. The poems vary in topic - broken hearts, hurting friends, the desire to be taken seriously, the need to let out the words that take up residence in our hearts and minds. But each line is strong and broken, gorgeous and precise. This is the sort of collection where you bargain with yourself to space it out, to take just a poem a day and savor it...but then you end up sitting down and reading it all at once. Something becoming prettier and ever more fleeting. I am a million fists clenching. The crunch of the snow underfoot. I am not many but alone I am just enough. I am not insufficient as I am. Not some "please excuse our current condition." Vital and necessary to the rest of my story. Always have been and will always be. And isn't that what matters? Because who judges what is important and what is not? Call the Titanic, tell them it's just an ice cube. It's just a few trees. I am not a dark cloud on the horizon. I am a sun shower gleaming far away. I am a forest of intricate roots hidden beneath the soil. 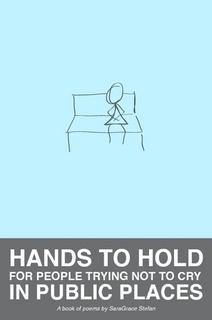 Hands to Hold for People Trying Not to Cry in Public Places is available at Amazon and Lulu. This is a story about love - not romantic love, but the love of childhood. 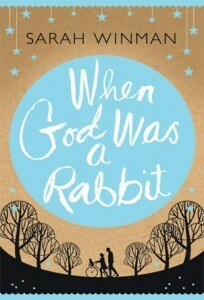 When God Was a Rabbit is about the relationship between Elly and her brother Joe. Elly and Joe grow up in England in the 1970s and 1980s, first in Essex and then in a remote bed and breakfast in Cornwall. Their charming, although not quite idyllic, childhood helps them to get through the difficult transition to adulthood. I hadn't heard anything about this book before my sister said I should read it. She found it in a hostel in Russia while traveling abroad. 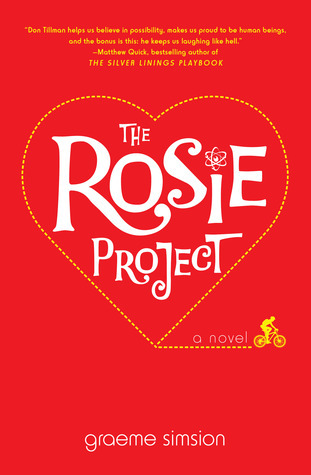 While this book isn't perfect, I found myself really drawn into Elly's life. Her family is good at holding family close and bringing other people into the fold. They adopt elderly neighbors, who become another aunt or an extra grandpa, and close childhood friends seem like just a few more siblings. This reminded me a lot of my own family. Books about growing up can easily become saccharine. We want to remember our childhood as a happy time, but an overly simplistic and adorable look at our early years is a tough thing to read. Happily, Winman does not fall into this trap. Childhood is magic but as we all know, magic means dragons and monsters too. There are very dark moments in this story. Instead of shying away from them, we see how they haunt us and shape us through the years. 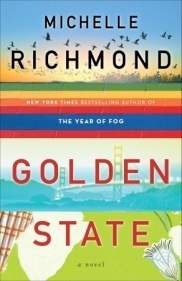 Winman is a unique writer - her prose makes this different than any childhood story you have read. This story also has a sense of humor. As you read, you may find yourself laughing and then wondering it you should have laughed at what just occurred. But in the midst of the humor, this comes very close to being an issues book. Elly's family seems to be affected by every major event that happens on both sides of the pond during the years the book covers. When Elly and Joe are affected by 9/11, I wanted to groan at yet again another writer capitalizing on this tragedy. But I was wrong - Winman uses it carefully and I found myself loving the characters enough to go along with the story. When God Was a Rabbit reminds us of the strength of family and the resiliency of the bond between siblings. Few modern stories capture both the sparkling magic and the intense darkness of childhood, but Sarah Winman's debut novel manages to bring both to vivid life. Hild is a girl with a gift. When she was born, her mother predicted that she would be the light of the world - the one who can predict what will happen, the girl who can put together the pieces that others cannot. As an advisor to her uncle the king, she has a unique position of power. But she also lives with intense and constant danger. In her time, kingdoms and religions are colliding and she sits in the epicenter. Who can she trust? Who is on her side and who is just looking for the next power play? When one wrong decision could mean death for Hild and for everyone she loves, every step is vital. This is the sort of book you want to live inside. Nicola Griffith has meticulously created a world on the verge of chaos. We readers get to enter 7th century England from a unique position. Hild gives us eyes and ears into both the weaving rooms with the women of the court and on the road to battle with the kingdom's warriors. But no one knows who will be in power next and everyone's motives are suspect. Hild travels with the king, from one town to another as they broker support for his rule and suppress uprisings. One of my favorite things about this story was the way we really understood Hild's loneliness. She is both incredibly powerful and horribly vulnerable. From her earliest days, her mother groomed her for power and prestige. She was not babied or allowed the luxury of a loving childhood. Instead, she was taught to observe others, taught to speak carefully, and to find the connections that other miss. She is constantly readjusting her balance between the masculine traits of bravado and violence with the feminine traits of observing and quietly working behind the scenes to make things happen. As one of the first of her people to learn to read, she realizes the power of the sword and of the carefully crafted word. Griffith essentially had five pages of source material from a history of the English people written by the Venerable Bede. With so little to draw from, she turned instead to research about the time period and placed Hild within those confines. Her research is incredibly evident. The reader learns about the traveling court, the day to day responsibilities of people in the 7th century, and the tumultuous shifts between allegiances. It would be easy to get bogged down in so much detail, but Griffith's lovely and observant prose moves this story along at just the right pace. 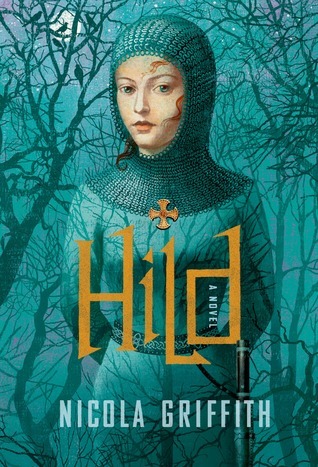 Many critics are happily touting Hild as a feminist book. I think this is probably the case but, in a wonderful turn of events, it is a wonderful and engaging story too. We can only hope that the real Hild was as determined, flawed, and fascinating as Nicola Griffith has written her. There are plans to write two more books about Hild, as these 560 pages take us just from Hild's precocious and precarious childhood through her teen years. I can't wait to see how Griffith imagines her road to becoming St. Hilda of Whitby. It's Monday and this week was all about Flavia! So what to say about this week? We finally started taking the Christmas decorations down... We are almost finished. We just have to solve the awkward problem of the ornaments that seem to have no boxes. On the reading front, I'm still slowly working through The Arabian Nights, but the focus this week has been on one Flavia DeLuce. I got the newest book from Netgalley, but realized I had only read the first two books in the series. So of course I stocked up at the library and this has been a wonderfully quirky week of chemistry, murder, and our favorite precocious eleven year old! 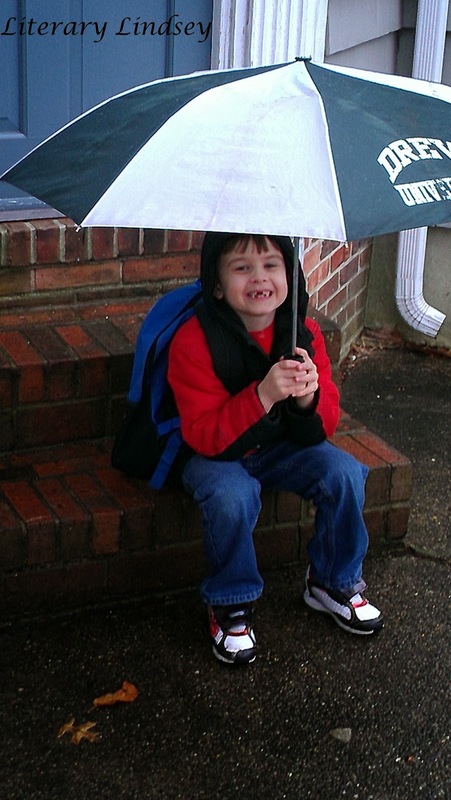 David - An umbrella and a smile are all you need to wait for the bus in the rain! James McParland was revered and vilified during his lifetime. 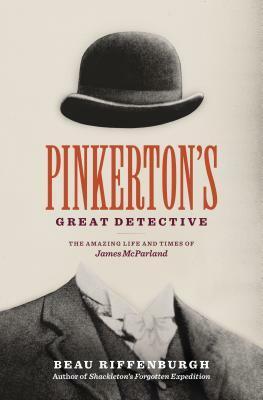 He worked for the (in)famous Pinkerton's Detective Agency, where he was responsible for bringing down the Molly Maguires and other union ringleaders. He rose in the ranks of the detective agency and oversaw the successful investigations of major corporations, train robberies, and Butch Cassidy and the Wild Bunch. In this book, Beau Riffenburgh attempts to sort out if McParland was really the greatest hero of his time or a mastermind who lied, cheated, and murdered to get his man and the fame that came with closing his case. This book is billed as a book about James McParland and it is, to some extent. But more than that, it is a very extensive look at the birth of labor unions in the US and the early justice system. For someone who is praised as a great detective, we just don't get a lot of insight into McParland's methods or his cases. It feels, rather, like a very thorough overview of American labor during this time period as opposed to a straight biography. McParland is just one player in a much larger story. Riffenburgh really creates an atmosphere of a country grappling with lawlessness. The justice system is in it infancy and much of it is privatized. Men like McParland who were trying to do right in a world of violence sometimes must act in less than honorable ways to catch their man. The author states from the outset that his goal was to discover if the great detective was a hero or a villain. Through his research, he discovers that McParland, like most of us, was neither. While this may make James McParland more human, it doesn't necessarily make for better reading. This book, for all of its meticulous research, lacks a narrative or a driving force that compels you to keep reading. Beau Riffenburgh is an impressive historian. He has closely researched the life of one of history's most controversial lawmen, along with the time in which he lived. But McParland's choice to keep the details of his life intentionally vague means that despite Riffenburgh's best efforts, we are left with an incomplete picture of his subject. While this is not a book that will keep you turning pages late into the night, it is our most comprehensive look at a tumultuous time in history and the man who attempted to keep order through it all. The Austin home is a place of happy chaos. The family includes four kids, several pets, and lots of noise. It seems like it should be no imposition to add one more child to the mix. When a family friend dies, his daughter Maggy joins the Austin clan. But Maggy does not fit well with Vicky, John, Suzy, and Rob. She is disrespectful to their parents, breaks toys, and disrupts their happy routine. Is there a place for Maggy in the Austin family? Meet The Austins is clearly a book for children. That being said, there is something enchanting about an adult writing a book from a child's perspective. L'Engle articulates all of the little mysteries and injustices of childhood better than we can when we are actually experiencing them. She captures the security of knowing we have a family who loves us and the slow change of family dynamics. While you could argue that this is simply a children's book about dealing with new circumstances, I think it goes deeper than that. It's about how we deal with changes in life: Maggy becomes sullen and causes trouble to deal with the loss of her father, Suzy is easily persuaded to join in Maggy's mischief making because one more child means a little less attention per kid, and Vicky acts out because her perceptions of her family are shifting. Reading as an adult, you pay attention to how the parents cope as well and the ways in which they help their children to heal and grow. "Aren't you sorry for people who don't laugh, Vicky?" "Yes. And people who don't love music and books." The Austin Family is charming. They care for each other very much and always hope for the best. But they can do this without becoming cloying. 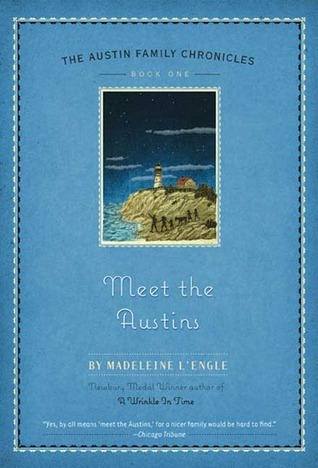 Reading about the Austins feels like receiving a big hug from Madeleine L'Engle and maybe, if you're lucky, it will remind you of your own childhood. On the brink of WWII, Flora is a desperate young woman with a difficult choice. Her parents' bakery is in financial trouble. A mysterious man makes her an incredible offer - she will pose as a nanny at an English estate and search for the last known Middlebury Pink Camellia. Flora hopes that the job will be quick and she can get back to her life. She never expects to love the children she cares for or to find a man she can't live without. Centuries later, Addison moves to the same estate with her husband Rex. A notebook gives Addison some insight into the past but it also causes her to ask some troubling questions about the people who lived in their house and loved the beautiful and rare Middlebury Pink Camellia. The Last Camellia is a good historical novel. It's not really a WWII novel - the war sort of dances around the peripheries of the plot. It is, however, one of those tales of an English manor house complete with wealthy inhabitants, their servants, and the various intrigues that go along with them. It's impossible to read through these pages without imagining the Livingston Manor in all of its glory - lush gardens, imposing rooms, and forbidden wings of the house. The novel is predictable in several places and seemed unlikely in others. There were several moments, particularly in Addison's timeline, when things seemed a little too convenient to actually occur. Flora knows nothing about children, but intrinsically understands what a preteen girl, two young boys, and a toddler need. The ending ties together so perfectly that Jio may as well have put a bow on the last few pages. But somehow that doesn't really take away from the story. I think there is a certain type of reading mood when you want something atmospheric that ends in all of the ways you hope. 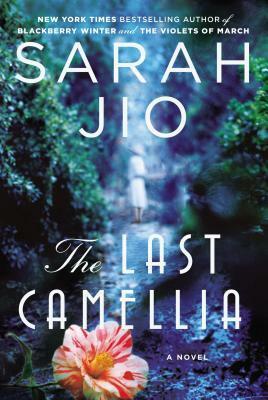 The Last Camellia is a great choice for a reassuring read - there is a mystery that will be solved, lovers will be reunited, and everything will end happily ever after. It's Monday again...who let that happen? Hello everyone! How are you? I feel like we are starting to get back into the swing of things, now that the holidays are over and David is back to school. I like a little routine, so this is a good thing! 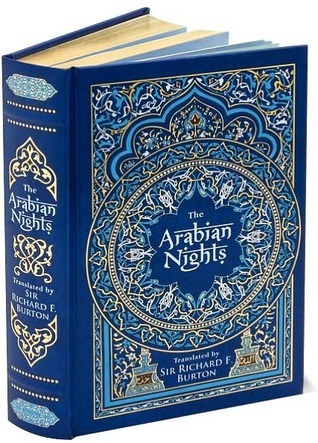 Reading-wise, I am still working through The Arabian Nights. 700 pages is not a quick read and at this point, I'm finding it a bit repetitive. I'm sticking it out though - I haven't even reached Aladdin yet! 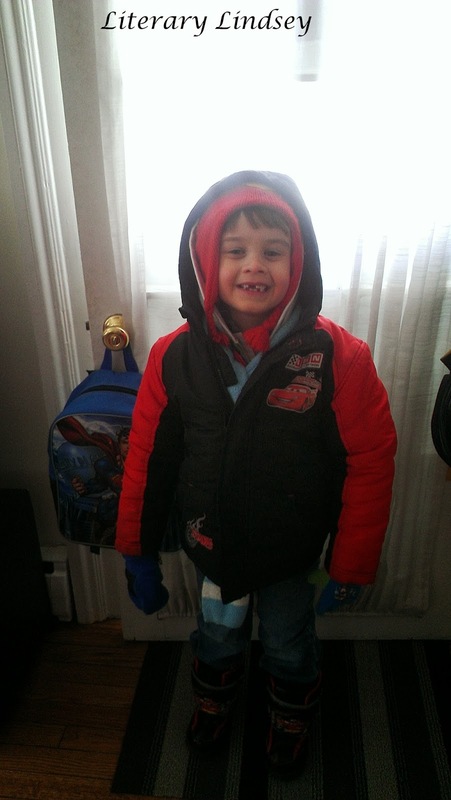 David: Off to the bus stop when it's six degrees outside! I love books that do new and fascinating things with a story. 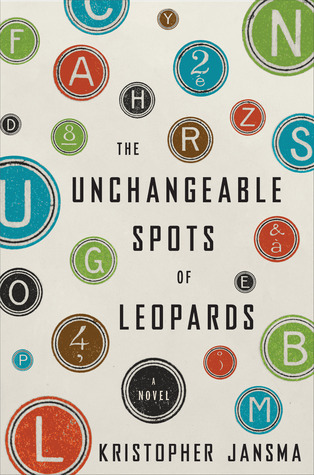 In The Unchangeable Spots of Leopards, we read from the point of view of a very unreliable narrator who provides multiple version of events. Reading this book is a lot of fun and will make you think about what truth means and what story can do. If you have not read this series, go. Now. Read it. 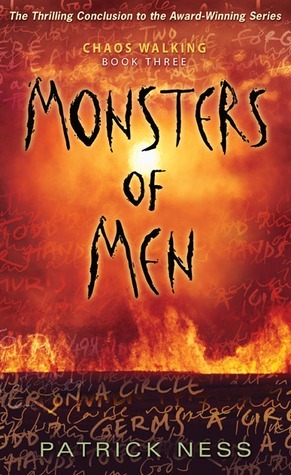 Patrick Ness is an exceptional writer. It's not until you have finished these books that you realize an amazing story actually asks some very important questions about war, power, trust, and control. 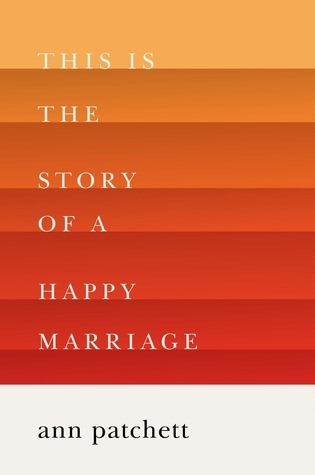 This short story collection is exquisite. The tales, like most good stories, are about love and birth and death. Each one will make you feel something - grief, anger, or joy. I want to read these stories on a weekly basis. 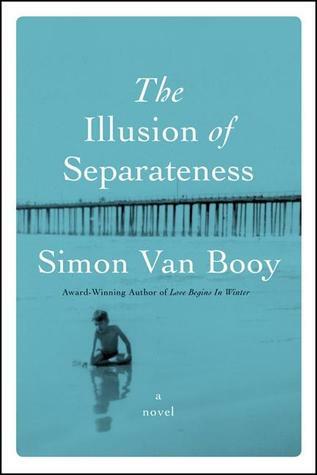 Simon Van Booy can write. He can really really write. His sentences are spare, but beautiful. I am so excited to read Van Booy's other books and revel in the amazing ways he uses words. 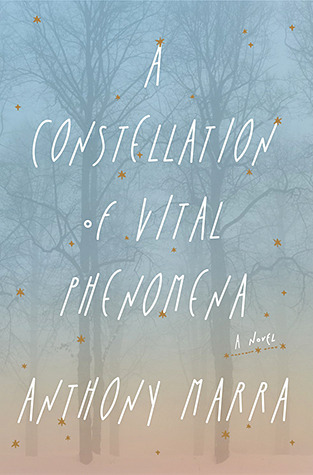 This is Anthony Marra's debut novel and I was blown away. The story takes place over 10 years in Chechnya as a brutal war rages on. Marra's care for each one of these characters is evident as he shares both the tiniest details and the moments that will irrevocably change their lives. 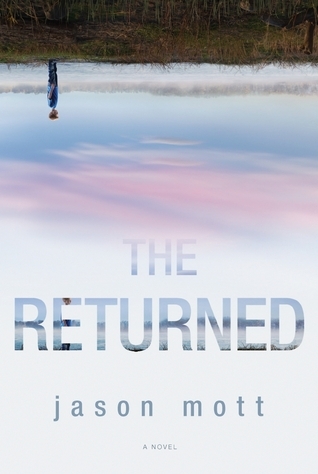 This might seem like a stunt novel - people who have been dead return to life without explanation. But in Jason Mott's hands, this becomes less a story about the living dead and more about the endurance of love. 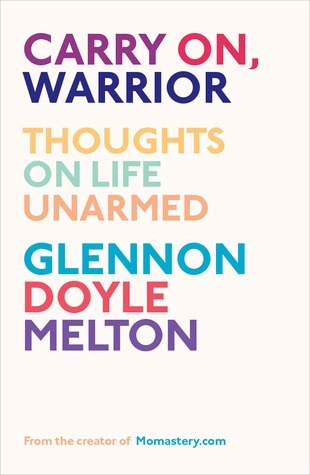 Bless Glennon Melton. With self-deprecating wit, she admits that she screws up...often. We all do. But she calls us to be brave in the face of life's cruelty and to care for each other. People sometimes get burned by their churches, particularly when they are wholeheartedly invested. 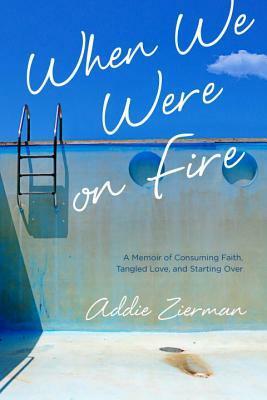 Addie Zierman is able to beautifully articulate both her disillusionment and her slow and hopeful journey back to the community of faith. Ann Patchett could write about taking out the garbage and it would be masterful. 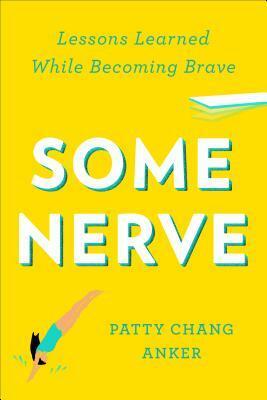 In this collection, she shares articles she has written for publications as diverse as Seventeen magazine and The New York Times. She finds import in the smallest moments and brings out the grace and beauty of life-changing events. This is a book you must read. 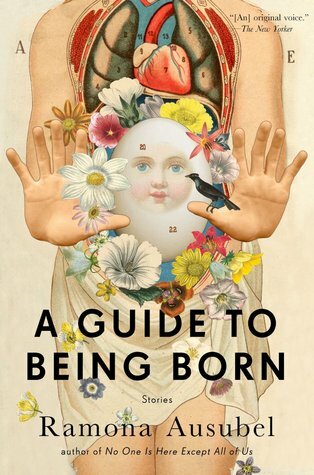 This collection of essays is from Strayed's tenure as advice columnist Sugar at The Rumpus. When answering these letters, Strayed calls them out on their failings while gently pushing them towards a solution. 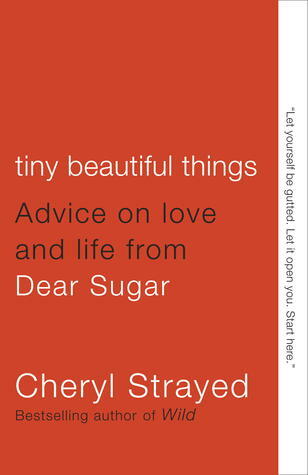 Cheryl Strayed is the very wise and wise-cracking fairy godmother of advice. What was your favorite book in 2013? Meghan and Bridget are sisters but their lives are very different from each other. Meghan is the face of Rise and Shine, a beloved morning news show. She spends her days with her husband and teenage son before being wined and dined by the elite of NYC. Bridget, on the other hand, is unmarried and has no children. She spends her days as a social worker helping the most hopeless residents of the city - orphans, the homeless, and victims of domestic abuse. When Meghan says something scathing on live TV, she is put on probation and runs away from her job, her family, and her life. It is up to Bridget to discover what Meghan's life was really like and bring her back home. This book is primarily about sisters - how well we really can know the people we love and how far our bonds can reach. Megan has always been the big sister who took care of her little sister. Their parents died when the girls were young and it has been the two of them against the world. When things start to fall apart, Bridget finds that she doesn't know here sister as well as she thought. It turns out that Meghan has two sides - the formal and professional side that she shows to the world and the exhausted side that is desperate to have some time to herself. Meghan and Bridget learn that family does not always work in the ways that we expect, but it always works if everyone shows up. Money and privilege are big themes throughout this novel. Meghan lives in a beautiful apartment, wears expensive clothes, and has a car at her disposal. Bridget spends her days trying to help women and children who are at the end of their ropes. The contrast between their lives is striking and Quindlen does a great job of capturing the glamour and celebrity and the violence and despondence. Quindlen's writing is straddling a fine line between a story and preaching about the evils of wealth and the hopelessness of poverty. Most of the time, I found this book to be sitting on the right side of that line. Ms. Quindlen is an engaging writer and I found myself sucked into the Meghan and Bridget's lives. 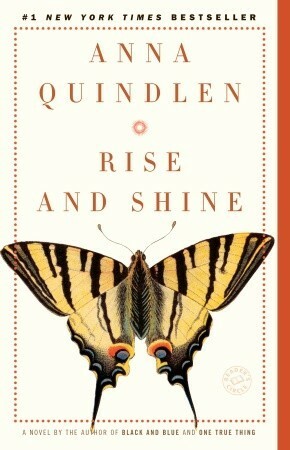 Rise and Shine is a great book about the ups and downs of work and fame and the endurance of family. 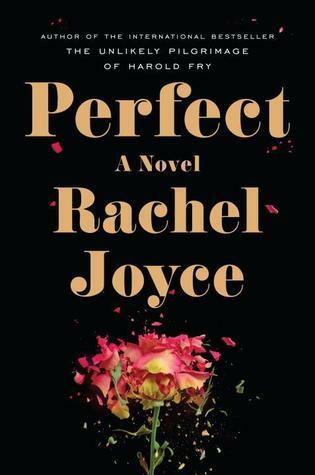 I enjoyed this book and if, as many reviewers say, this is the least of her novels, I am excited to read her others. 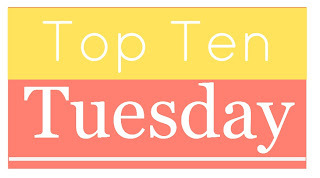 Today I am linking up with The Broke and The Bookish for Top Ten Tuesday. It's time to talk about our goals for this year: goals for reading and blogging and general life. Like a lot of bloggers, I tend to get caught up with all of the books that are being released. But I know there are a ton of classics that I haven't read yet and I think reading a variety of books from different places and times makes you a better reader (and writer!). I don't do a terrible job of this. 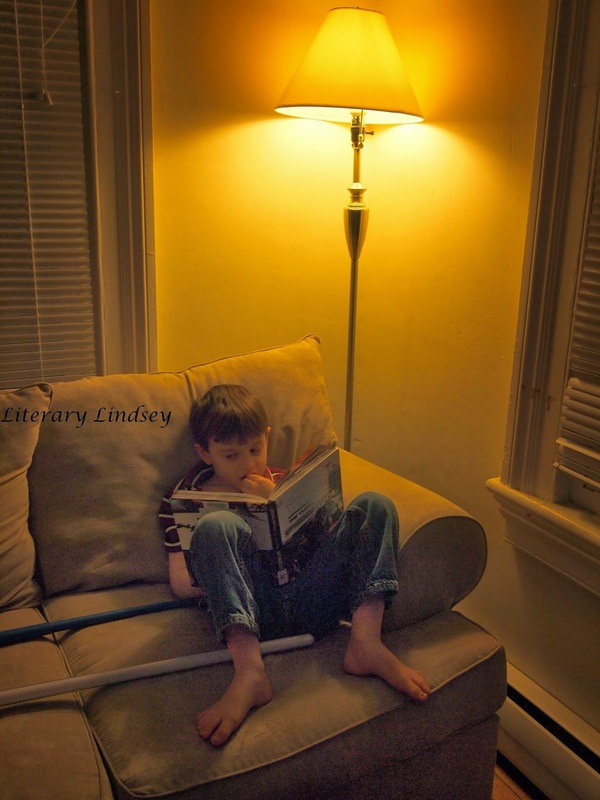 In 2012, I read 19 non-fiction books, but I want to make sure I'm not just reading fiction. There is so much to learn from non-fiction and I'm game to learn it all! I've been blogging since the summer of 2011. There are a few things I do regularly now, such as It's Monday, What Are You Reading? and Dewey's Readathon. This year I want to find one new thing to do - a meme or readathon or challenge that will be new for me and this little corner of the bookish universe. I think I would like to do something like this project. It's a great way to make sure I am taking pictures of my kids (and maybe me too) each week during the year. 5. Pay off my library fine. Now before you start laughing about signing my yearbook, I have to confess that I'm not great about talking regularly with my friends and family. Some of this has to do with the difficulty of having a conversation with a crying baby and a constantly hungry little boy. The rest, I think, comes from my weird introvert/extrovert balance. I'm perfectly happy to stay at home and read and just be with my family until I am suddenly and very seriously not okay. I think there won't be such a drastic shift if I do a better job of talking to people and spending time with them. So I'm going to try to do one thing each week - call a friend, have a Skype date, or send an email. I do pretty well with drinking a lot of water. But most days, I hit mid-afternoon and I'm looking for something that actually has a taste. I will sometimes have soda or juice if it's in the house but I feel like I need a go to drink other than water. Ok, so it's the time of year where we all go to the gym for a few weeks or dig our Jillian Michaels DVDs out of the closet. I want to be realistic here, realizing that I need the benefits of exercise with the flexibility of a mom with two littles who freelances from home. So I am starting out slow and resolving to exercise for at least 15 minutes at least three times a week. I can always do more, but I know my goal is reachable even with crying babies and crazy fluctuating schedules. If I'm being honest, most nights I just crawl into bed with a book and that is that. I know (somewhere in the back of my mind) that I should be washing my face and doing some sort of nightly skin care routine. I'm just not sure what that should be. Any ideas? What goals are you making for this year? It's Monday - look at all of the books!! Hello friends! 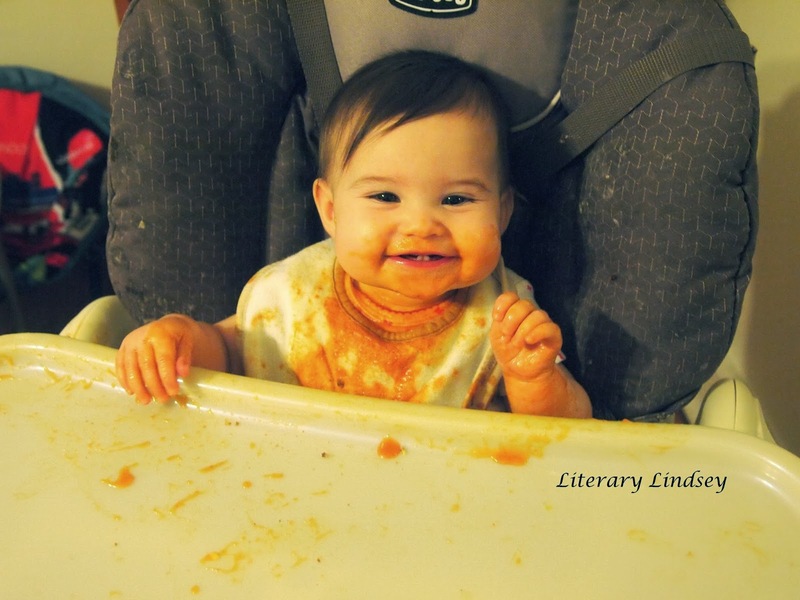 How have the first few days of 2014 treated you? I made my goal of 110 books in 2013 right under the wire. I was reading until about 11:30 on New Year's Eve. I ended up picking up a short Madeleine L'Engle book on New Year's Eve Day because this genius decided December was a wonderful month to read a lot of giant books. I realized that I never shared my Christmas book loot with you. Below, I give you three pictures. The first consists of the books that I read and loved so much that I asked for them for Christmas. They needed to live on my bookshelves so that I could happily look at them and reread them when the fancy strikes. The second picture shows the books that I received, but haven't read yet. The third one is of the books I picked up with a B & N gift card this week. Hooray!